Our goal at the Church of Christ on Green Oaks is to pattern everything we do after the church you can read about in the New Testament. Our focus is on what the word of God says and on what we as His children should do to worship, serve, and please Him. God desires for each of us to have a relationship with Him; and with any good relationship, there is mutual communication. The Lord wants His children to hear Him from His word, to rejoice always, and to pray without ceasing (1 Thessalonians 5:16-17). In the midst of the assembly, we will sing praise to God and will sing with the spirit, and will also sing with the understanding, speaking to ourselves in psalms and hymns and spiritual songs, singing and making melody in our heart to the Lord as we sing a capella (Hebrews 2:12, 1 Corinthians 14:15-16, Ephesians 5:19, Colossians 3:16). Each service is dedicated to giving attention to reading, to exhortation, and to doctrine with a belief that all scripture is given by the inspiration of God and is profitable for doctrine, for reproof, for correction, and for instruction in righteousness that the children of God may be perfect, and thoroughly furnished unto all good works (1 Timothy 4:13, 2 Timothy 3:16-17). The focus of the Sunday morning worship assembly is the observance of the Lord's Supper. Having given His life for the redemption of mankind, Jesus has asked us to remember Him as we commune around His table. This observance follows Jesus' example as recorded in Matthew 26:26, Mark 14:22, Luke 22:14 and 1 Corinthians 11:23, using a single loaf of unleavened bread, representing the Lord's body, and a single cup containing the fruit of the vine, representing the New Covenant ratified by the blood of Jesus on the cross of Calvary. God gives instruction to His children to give or to lay by in store financial contributions on the first day of the week for the purpose of assisting other needy Christians and for spreading the Gospel message of Jesus Christ. This act of worship is done each Sunday morning with a cheerful heart as we have been prospered as a result of God's blessings (1 Corinthians 16:1, 2 Corinthians 9:6). God so loved the world that He gave His only begotten Son, that whoever believes in Him should not perish but have everlasting life (John 3:16). Jesus is the world’s Savior because He offers salvation from sin and its eternal punishment. When Jesus died on the cross, He suffered the penalty for sin in our place, and thus satisfied the righteous demands of heaven. Jesus turned the shame of the cross into a glorious victory for all of mankind. Paul wrote that the message of the cross is foolishness to those who are perishing, but to us who are being saved it is the power of God (1 Corinthians 1:18). The shed blood of Jesus on Calvary is God's gift to humanity, and we have been given instruction by God about how to receive this very special gift. In God's word, we find the following commands and examples about how to become a child of God, thus taking advantage of the blood of Jesus. Must hear the words of Jesus and obey (Matthew 7:24, Romans 10:13-17). Be guided by the word of God (Acts 8:30-35). One who loves Jesus will hear and keep His commands (John 14:21-24). Faith is a belief in or confident attitude toward God and is the substance of things hoped for, the evidence of things not seen (Hebrews 11:1). Faith comes by hearing the word of God (Romans 10:13-17). Without faith, it is impossible to please God (Hebrews 11:6). There is eternal salvation for those who hear Him and obey Him (Hebrews 5:8-9). Repentance is a godly sorrow for sin, an act of changing our mind about sin and then turning around and going in the opposite direction, thus changing our relationship with God. Repent of your sins or you will perish (Luke 13:3). Repent and be converted to Christ, that your sins may be wiped out (Acts 3:19). Repent and be baptized for the remission of your sins (Acts 2:38). Verbally proclaim that you believe that Jesus Christ is the son of God (Acts 8:37). Confession before men that Christ is the son of God (Matthew 10:32-33). Confess with your mouth the Lord Jesus unto salvation (Romans 10:9-10). Baptism is the immersion of the body in water, re-enacting the death, burial, and resurrection of Jesus for the remission of sin (Romans 6:1-6; Colossians 2:12-13; Acts 8:35-39; John 3:3-5). Repent and be baptized for the remission of sins (Acts 2:38). Be baptized and wash away your sins (Acts 22:16). He that believes and is baptized shall be saved (Mark 16:16). 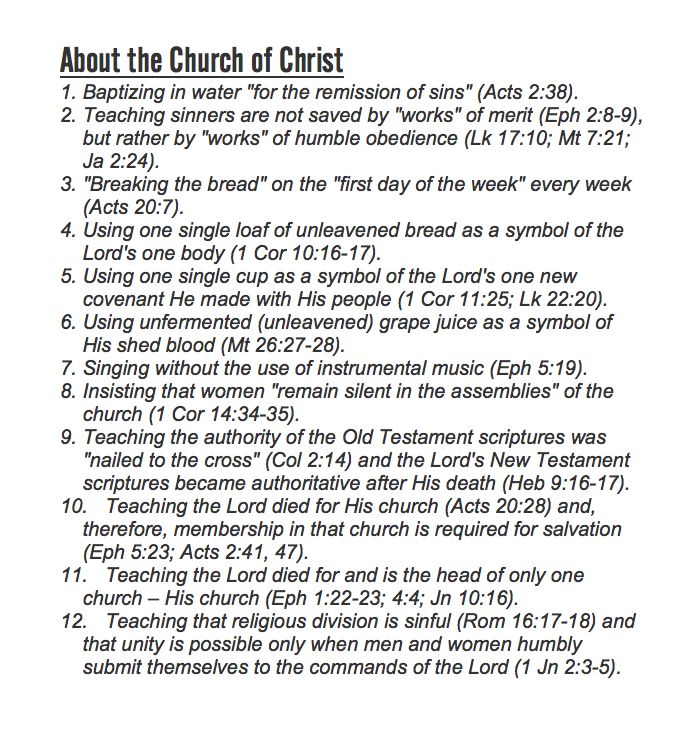 Baptism adds one to the Lord's church (Acts 2:47). Baptism is an act of obedience and faith that puts one into Christ (Galatians 3:26-28).